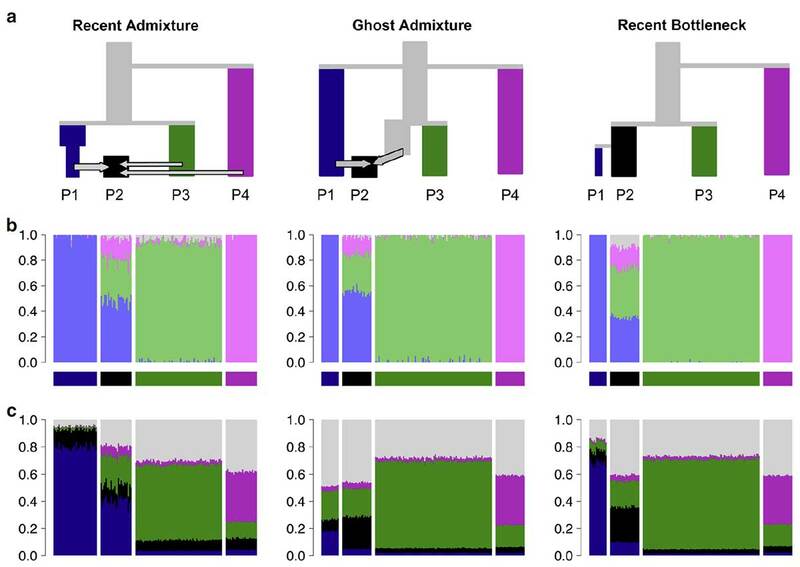 New paper (behind paywall), Ancient genomes from Iceland reveal the making of a human population, by Ebenesersdóttir et al. Science (2018) 360(6392):1028-1032. 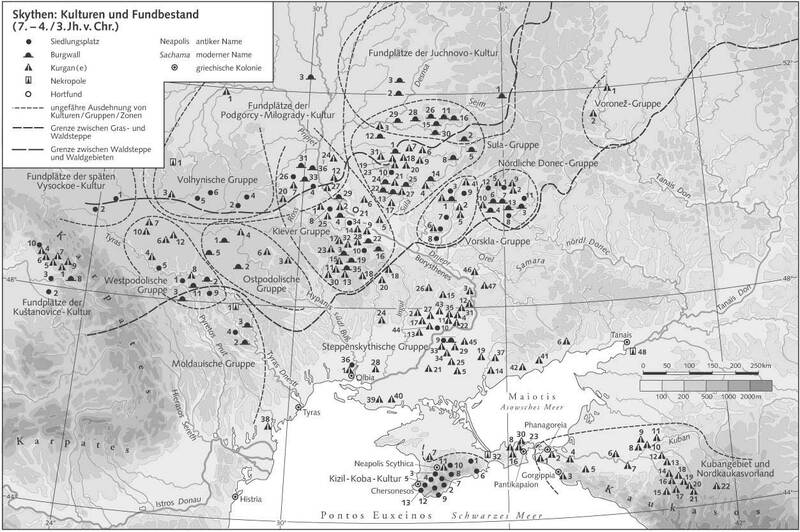 Opportunities to directly study the founding of a human population and its subsequent evolutionary history are rare. 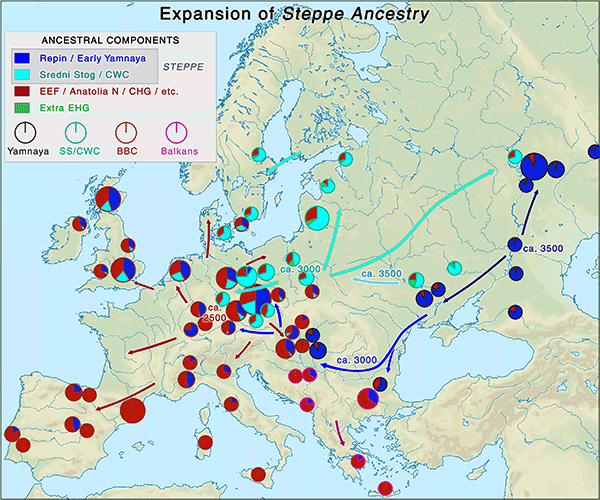 Using genome sequence data from 27 ancient Icelanders, we demonstrate that they are a combination of Norse, Gaelic, and admixed individuals. 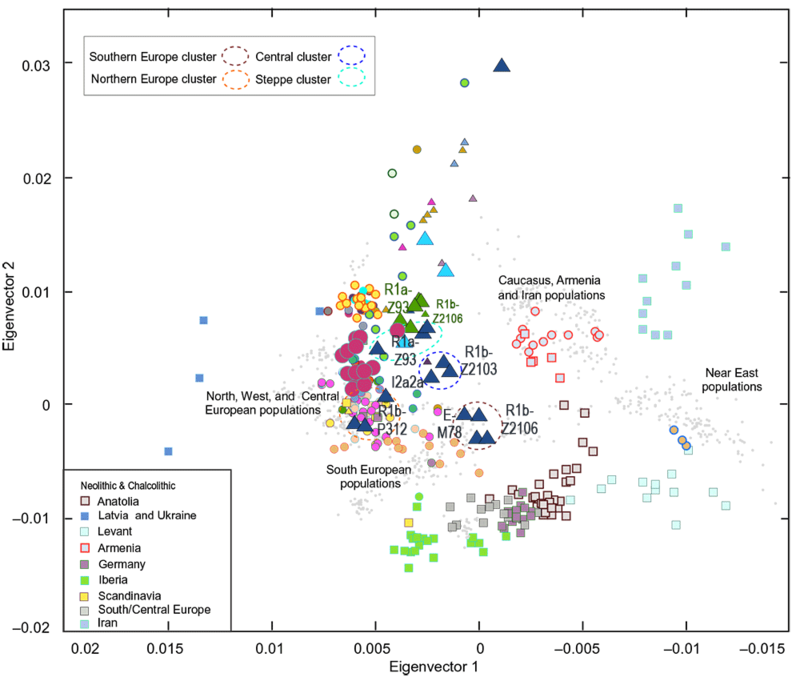 We further show that these ancient Icelanders are markedly more similar to their source populations in Scandinavia and the British-Irish Isles than to contemporary Icelanders, who have been shaped by 1100 years of extensive genetic drift. 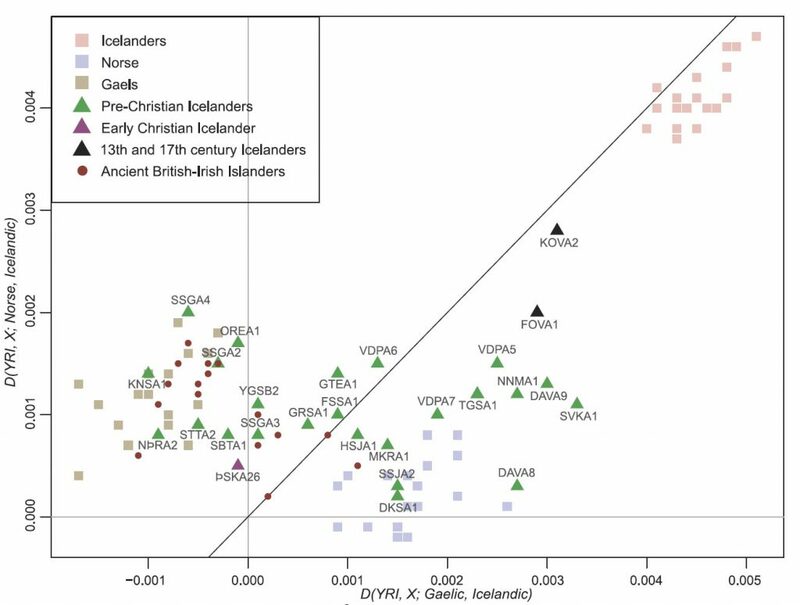 Finally, we report evidence of unequal contributions from the ancient founders to the contemporary Icelandic gene pool. These results provide detailed insights into the making of a human population that has proven extraordinarily useful for the discovery of genotype-phenotype associations. 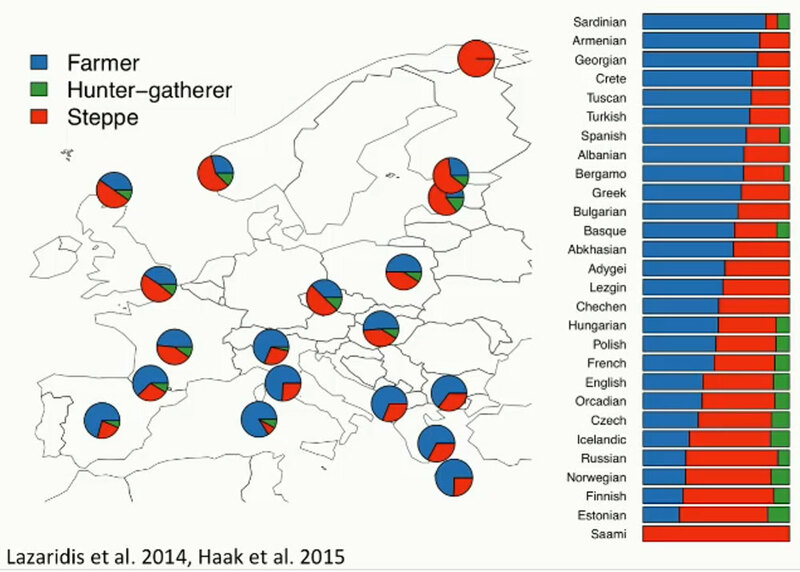 Shared drift of ancient and contemporary Icelanders. 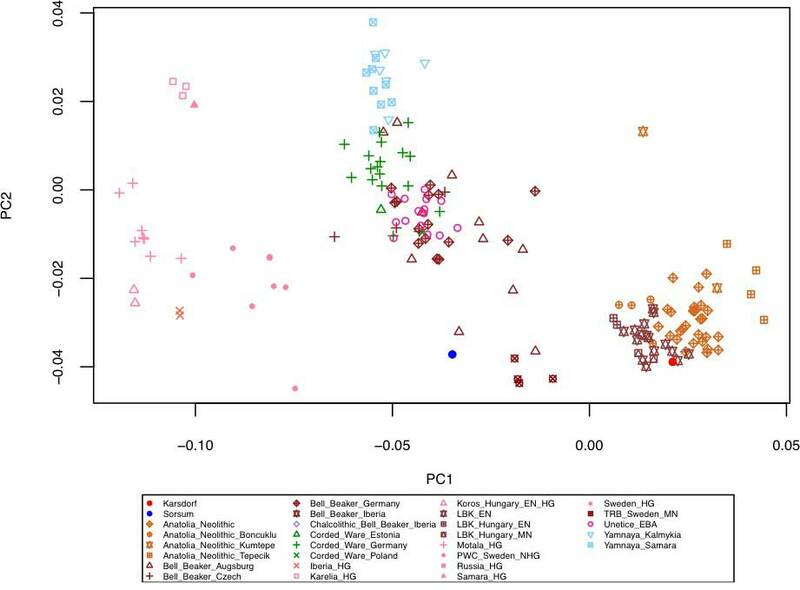 (A) Scatterplot of D-statistics reflecting Iceland-specific drift. 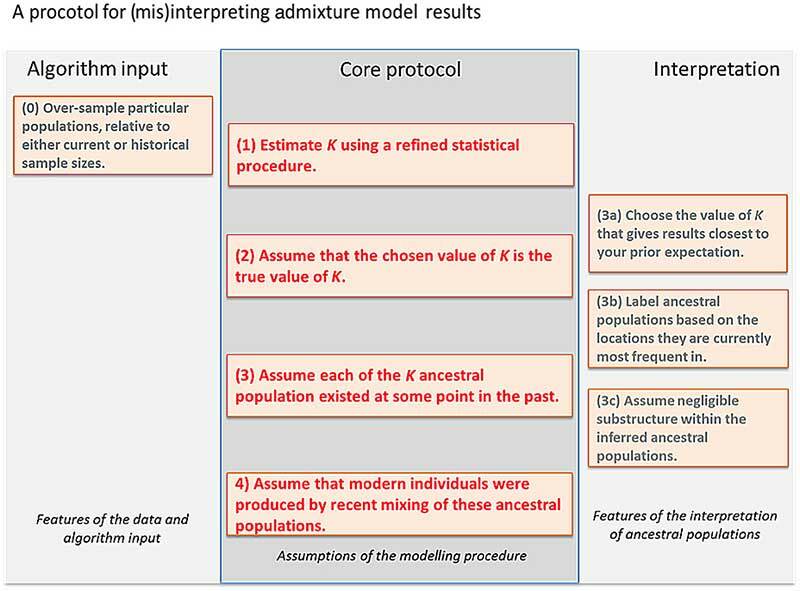 To aid interpretation, we included values for ancient British-Irish Islanders and a subset of contemporary individuals (who were correspondingly removed from the reference populations). 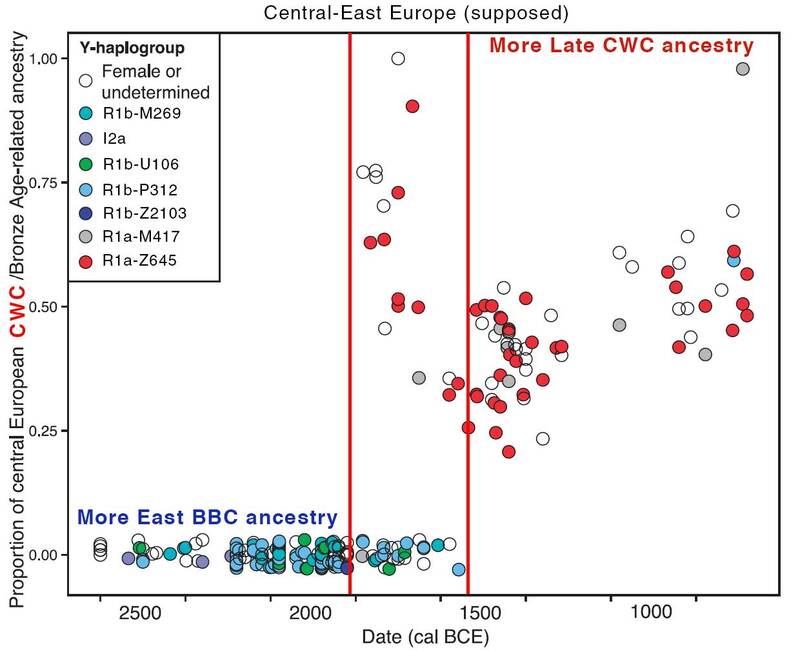 We estimated the mean Norse ancestry of the settlement population (24 pre-Christians and one early Christian) as 0.566 [95% confidence interval (CI) 0.431–0.702], with a nonsignificant difference betweenmales (0.579) and females (0.521). 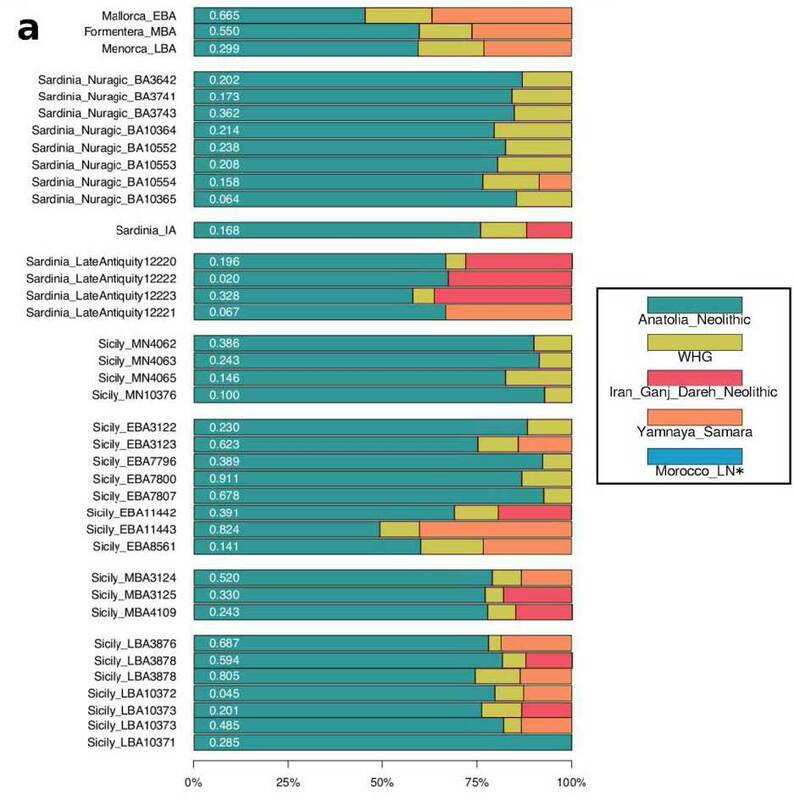 Applying the same ADMIXTURE analysis to each of the 916 contemporary Icelanders, we obtained a mean Norse ancestry of 0.704 (95% CI 0.699–0.709). 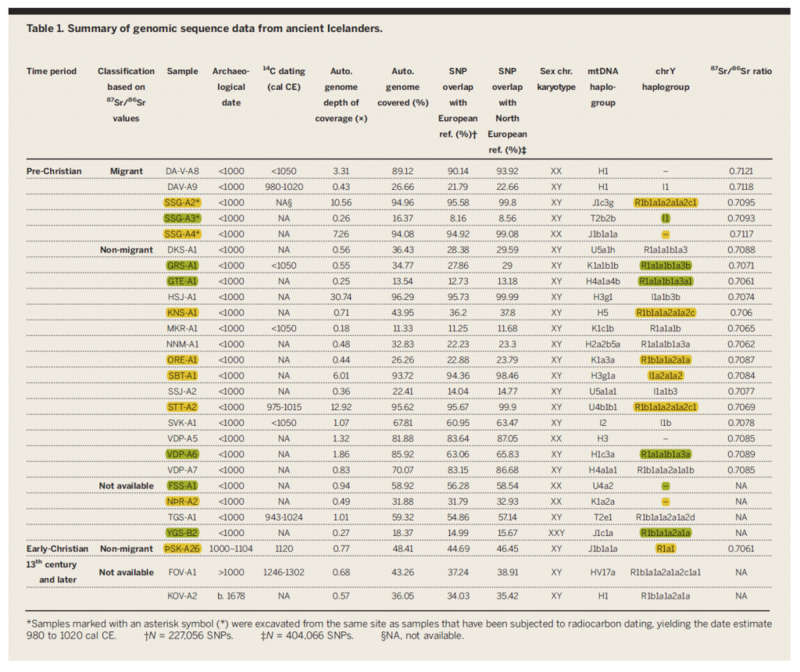 Although not statistically significant (t test p = 0.058), this difference is suggestive. 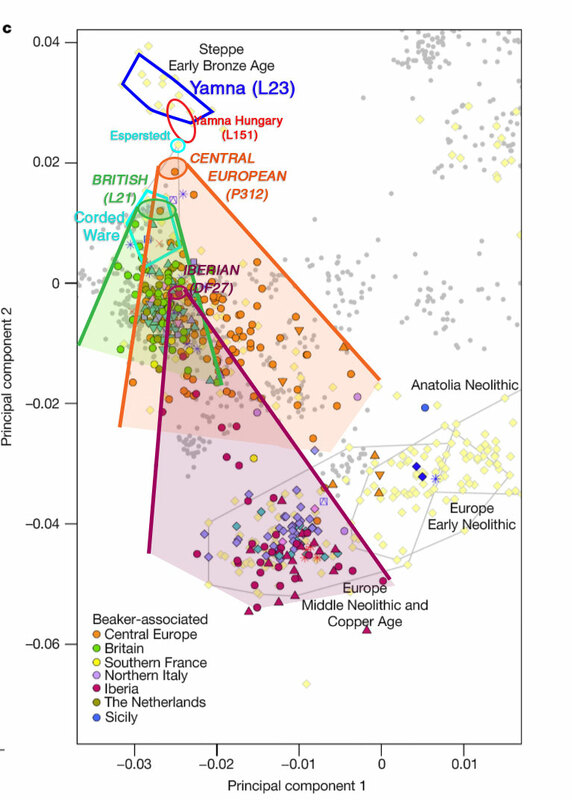 A similar difference ofNorse ancestry was observed with a frequency-based weighted least-squares admixture estimator (16), 0.625 [Mean squared error (MSE) = 0.083] versus 0.74 (MSE = 0.0037). 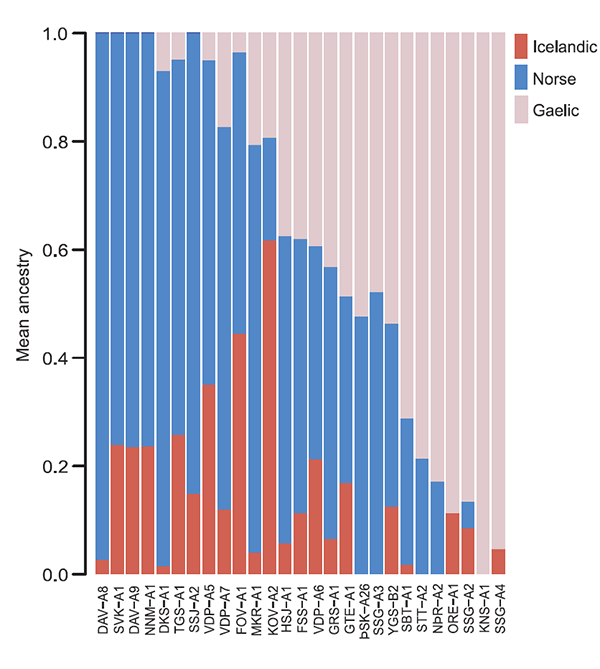 Finally, the D-statistic test D(YRI, X; Gaelic, Norse) also revealed a greater affinity between Norse and contemporary Icelanders (0.0004, 95% CI 0.00008–0.00072) than between Norse and ancient Icelanders (−0.0002, 95% CI −0.00056–0.00015). This observation raises the possibility that reproductive success among the earliest Icelanders was stratified by ancestry, as genetic drift alone is unlikely to systematically alter ancestry at thousands of independent loci (fig. S10). We note that many settlers of Gaelic ancestry came to Iceland as slaves, whose survival and freedom to reproduce is likely to have been constrained (17). 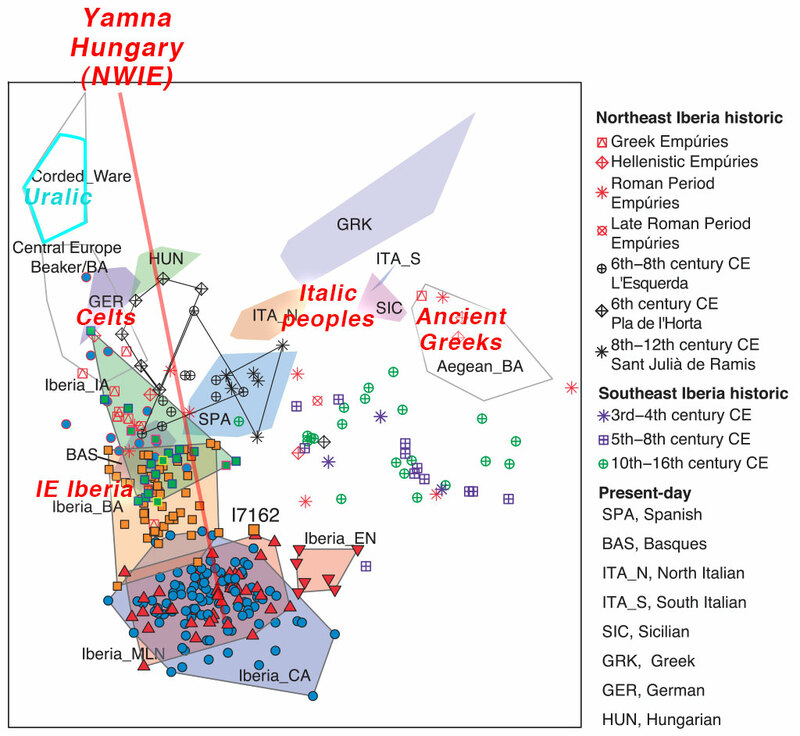 Some shift in ancestry must also be due to later immigration from Denmark, which maintained colonial control over Iceland from 1380 to 1944 (for example, in 1930 there were 745 Danes out of a total population of 108,629 in Iceland) (18). 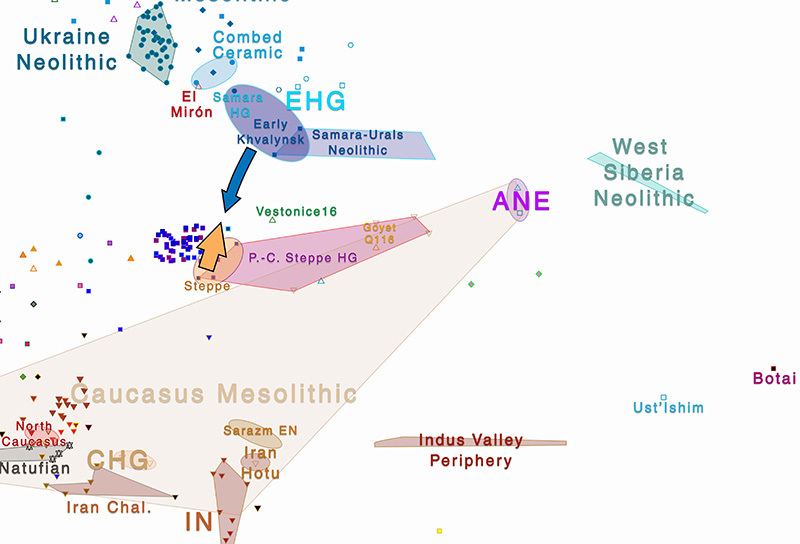 (…) as the five ancient Icelanders fall well within the cluster of contemporary Scandinavians (Fig. 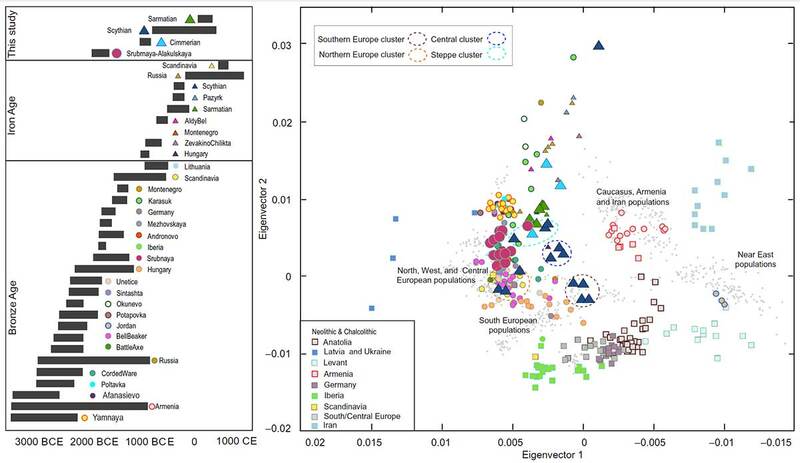 3C), we conclude that they, or close relatives, likely contributed more to the contemporary Icelandic gene pool than the other pre-Christians. We note that this observation is consistent with the inference that settlers of Norse ancestry had greater reproductive success than those of Gaelic ancestry. 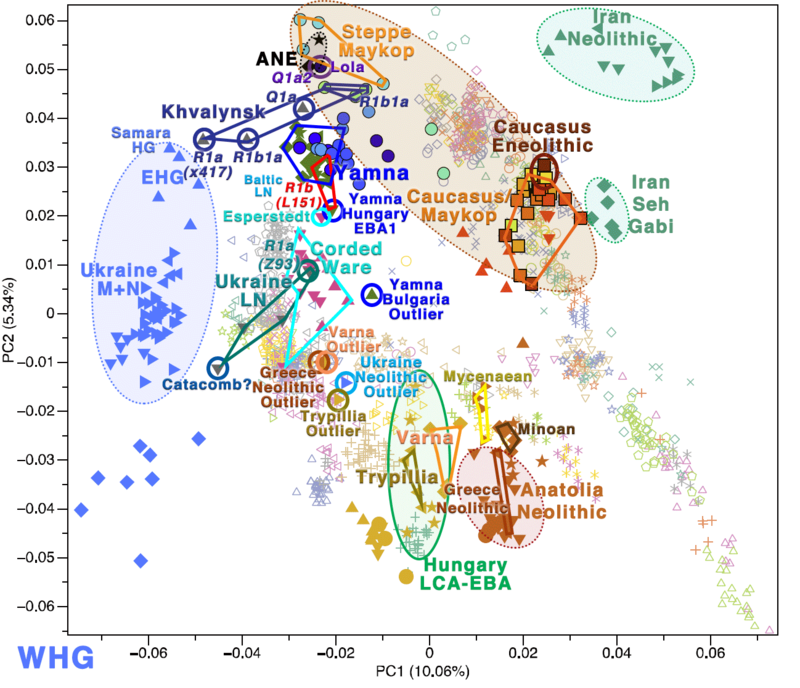 Haplogroup data, from the paper. 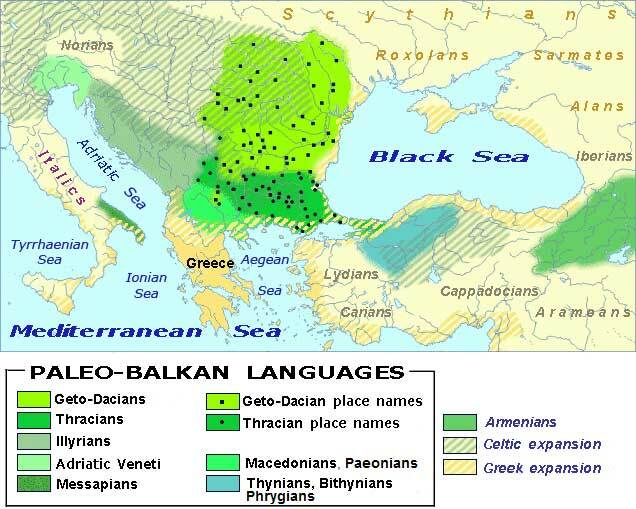 Image modified by me, with those close to Gaelic and British/Irish samples (see above Scatterplot of D-statistics and ADMIXTURE data) marked in fluorescent: yellow closer to Gaelic, green less close. 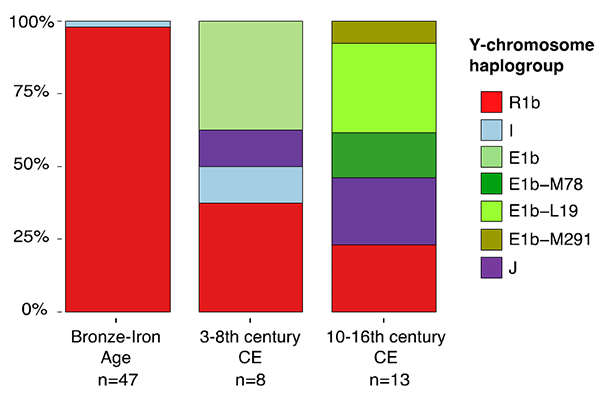 Ancient Icelanders show a clear relation with the typically Norse Y-DNA distribution: I1 / R1a-Z284 / R1b-U106. Among R1a, the picture is uniformly of R1a-Z284 (at least five of the seven reported). 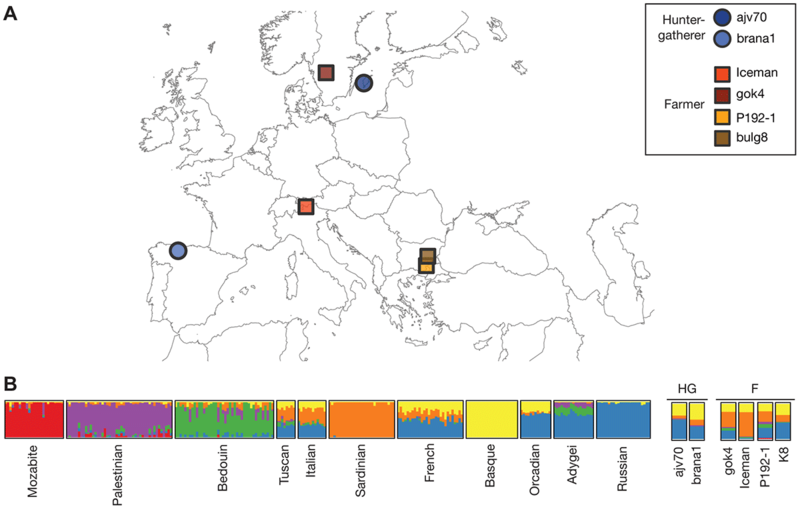 There are six samples of I1, with great variation in subclades. 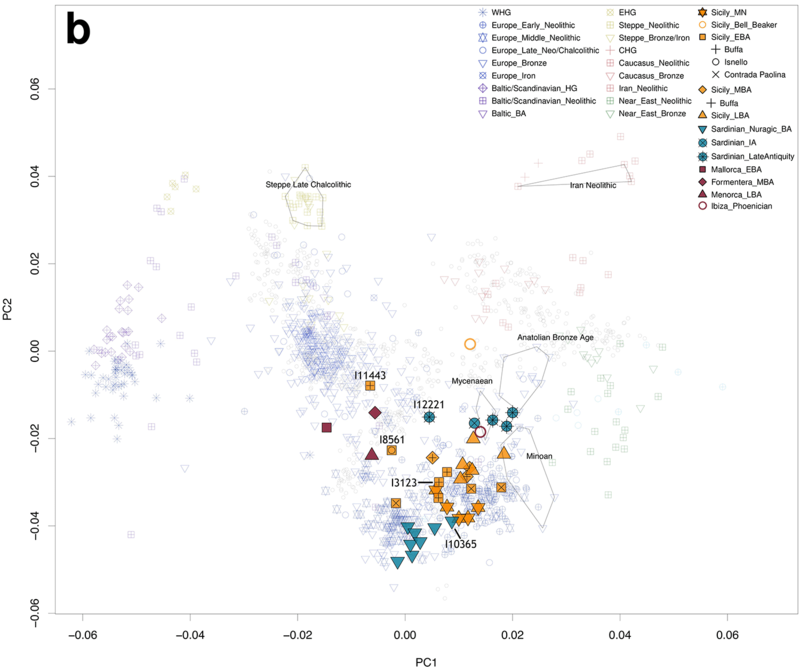 Among R1b-L51 subclades (ten samples), there are U106 (at least one sample), L21 (three samples), and another P312 (L238); see above the relationship with those clustering closely with Gaelic samples, marked in fluorescent, which is compatible with Gaelic settlers (predominantly of R1b-L21 lineages) coming to Iceland as slaves. 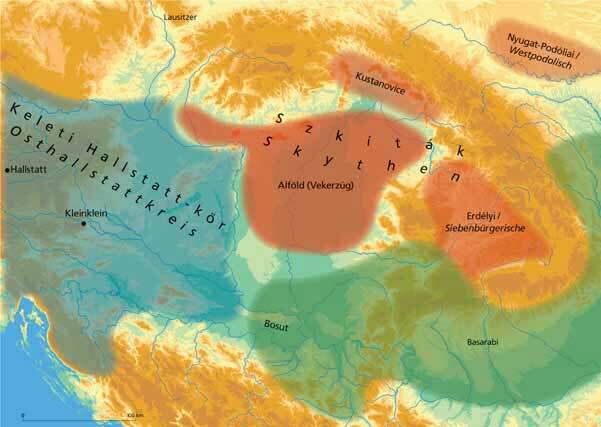 Probably not much of a surprise, coming from Norse speakers, but they are another relevant reference for comparison with samples of East Germanic tribes, when they appear. 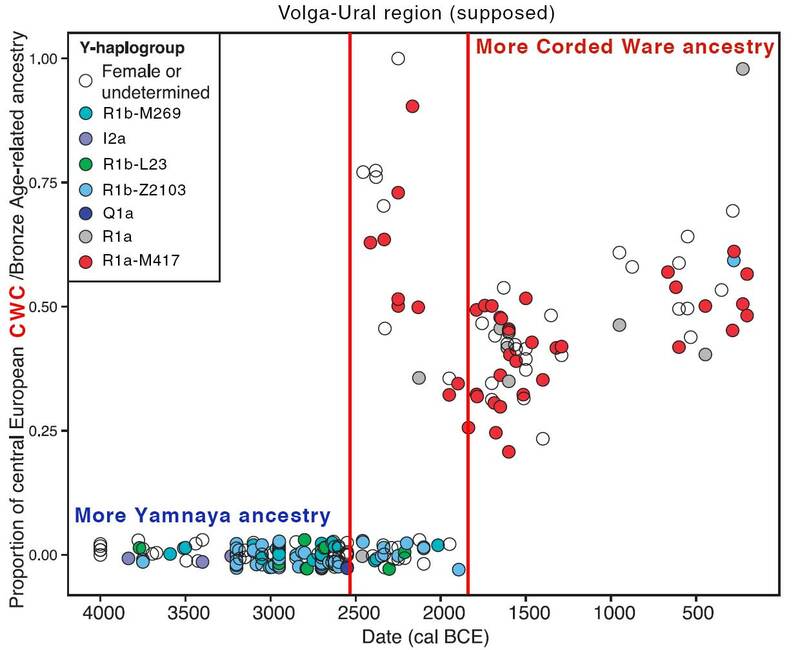 Also, the first reported Klinefelter (XXY) in ancient DNA (sample ID is YGS-B2).